In our July issues of Wood News and The Highland Woodturner, we featured the shops and projects of several woodworkers. Show Us Your Shop: Pat Lemley retired almost 20 years ago and has since built a brand new shop in order to have a better dust collection system than what was in his basement shop. Pat built 95% of the shop himself and the design was based off of a 2-car garage, which he modified to make the perfect shop. The shop is 2 stories and features a dust collection system and lumber storage on the second floor, while the rest of the shop equipment is downstairs on the first floor. CLICK HERE to find out more about Pat’s shop. Show Us Your Woodworking: Jim Mossoney, a woodworker from Defiance, OH, has been woodworking for 25 years and is an avid user of hand tools. He has recently addd veneering to his woodworking skills because he says that “good figured wood is getting harder to find.” His favorite project to make is a small nightstand, which he gives to family members as wedding presents. 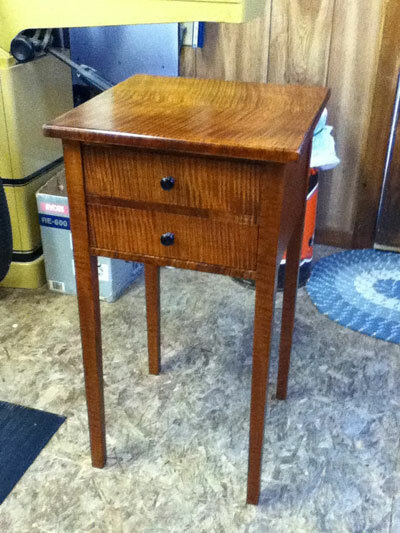 The nightstand featured above is made up of a combination of veneer tiger maple and regular boards of tiger maple. CLICK HERE to see more of Jim’s projects. Show Us Your Carving: Pierre Vigneux has been an on and off carver for most of his life, having completed an average of 1 to 2 carvings per year. He has made some beautiful, realistic carvings, including the Trapeur Indiens carving seen above. 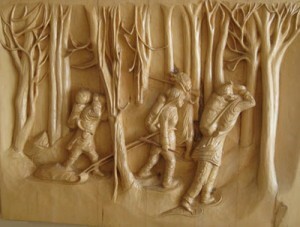 You can see more of his carvings HERE. 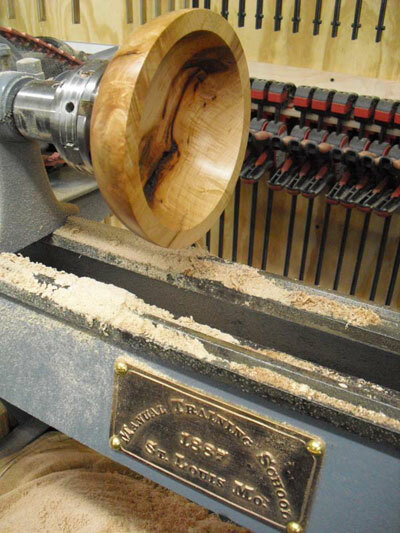 Show Us Your Woodturning Shop: Dennis Purcell has a collection of “old” iron tools that were all made between the 1930’s to the 1970’s, some of which he has been able to rebuild so that they can be used today. His most recent acquisition was an old lathe that is believed to have been made as a student project over 50 years ago. CLICK HERE to read more about this “old” lathe and tool rebuilds.